I think that has more to do with him being a “meat and potato” man than with me being some culinary genius but I’ll take it. I've been cooking a lot of crock pot meals in the last two months since Brutus has been playing baseball every Sunday so when Husband asked for beef stew I was all over it! I make my beef stew the same way I make my pot roast, I just cut up the meat and vegetables smaller and cook it in the crock pot. I would like to have added peas but since I was making it per Husband’s request I decided not to ruin his whole week by adding peas. And he might have said, “But don’t put any peas in it.” and “You’re not going to put peas in it are you?” and “I don’t like peas in it” a time or two. Cut chuck roast into 1.5 - 2 inch pieces and season with salt and pepper. Heat vegetable oil in a large skillet over medium-high heat and sear chuck roast pieces in batches (don’t overcrowd the pan or the meat won’t sear properly). When seared, place chuck roast pieces in a large crock pot. Optional step… I like to sauté the onions and then the carrots in the same pan that I seared the meat in because I think it really helps develop the flavor but you don’t have to. Add carrots and onions to crock pot. Combine soup mix, garlic, water and worcestershire sauce and stir until soup mix is dissolved. Optional step… I deglaze the skillet with the soup mixture to capture all the glorious flavor but, again, you don’t have to. Add soup mixture and potatoes to crock pot and stir to incorporate all ingredients. Cover and cook on low for 8 hours. One hour before the stew is done, ladle out about 1/2 cup of broth. Set aside to cool. 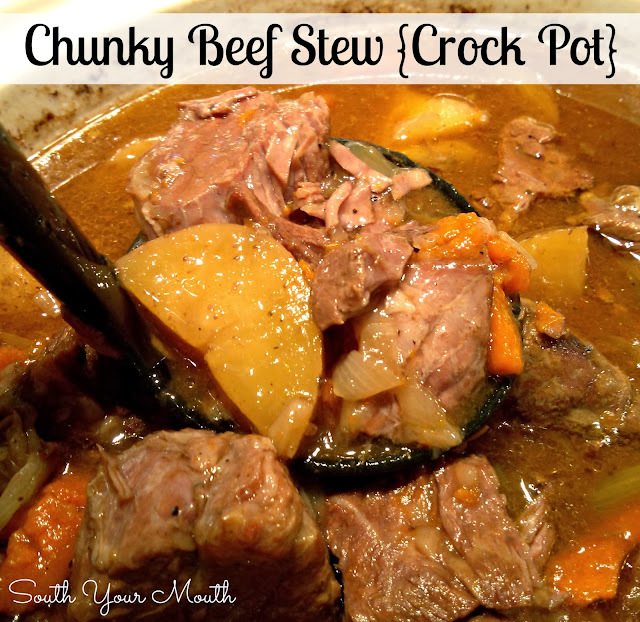 Increase crock pot temperature to high. Add cornstarch to a small bowl then whisk in cooled broth until smooth. Add cornstarch slurry to crock pot, cover and continue cooking for 30 minutes or until broth has thickened. Liz, she's referring to the cornstarch and 1/2 cup of cooled broth (slurry). I'm sure it's a southern thang. You had me at crock !! Wow... two envelopes for such a small roast???????? Please define "small" potatoes .... Did you actually make this??? Omgosh. Best. Reply. Ever. Found you today and girl, I am love with your food and your site. We don't have to be hateful, we can just say, "Bless your heart." You have a new fan!! This looks and sounds delicious! This would be right up my husband's alley. Crock pot anything is always a hit at our house. im like the other anonymous, not near enough water to cover all those ingredients, I can always use a hug. Remember that less liquid is needed in a crockpot, anon, recipes condensate (maybe that's the right word??) and create more liquid than when you started. You don't want to dilute the amazing-ness! Hugs from me as well! you were right, it made enough juice (I would have never guessed) 1/4 cup cornstarch to 1/4 cup cooled stock? I like my beef stew with tomatoes in it. Is that strange? Oh well, that's the way mama made it and the way I love it. I'm going to make this recipe but add in a can of stewed tomatoes. I've never cut up a roast for beef stew, though. Always bought the stew meat cut up. I think I'll go for it! Also, 3 cups of water is by George plenty of liquid, I would think! Cutting up a roast is so worth the effort. Chuck roast is a better cut of meat and most of the precut stuff is off the round (the buttocks) and is tough. Also, my kids don't like stewed potatoes ( I know, I know...I think their daddy dropped them on their heads.) so I leave them out and serve the potato-less stew over mashed potatoes. Yummy! Got this ready this morning before I left for work, (I actually spent more time cooking than getting ready...sad I know, but I love food).....My house smelled amazing...I can't wait to get home tonight to eat this!! Thank you! I love using Yukon Gold potatoes. They withstand the slow-cooker process better than any other potato variety I have tried. In the winter (live in Michigan) we make stew often. We call it "hearty food". What is granulatd garlic? Is that like garlic salt? It's the actual term for garlic powder. But since you're the 40-leventh person to ask me that, I'm going to change it to garlic "powder". Sorry to be confusing! I made this, its cooling now. Half of recipe with 2 lb meet, 1 onion, 4 carrots, 3 med potato, 1 envelope, 1 1/2 c water, cooked on low for 5 hr 45 min, then on high 15 minutes after the starch slurry. Best stew ever!!!!!! Can't wait for it to cool, ima eat it for breakfast :) Thank u for sharing your recipe. I LOVE it. I'm making this right now. My little tasting of it makes me want to to say "well south your mouth". 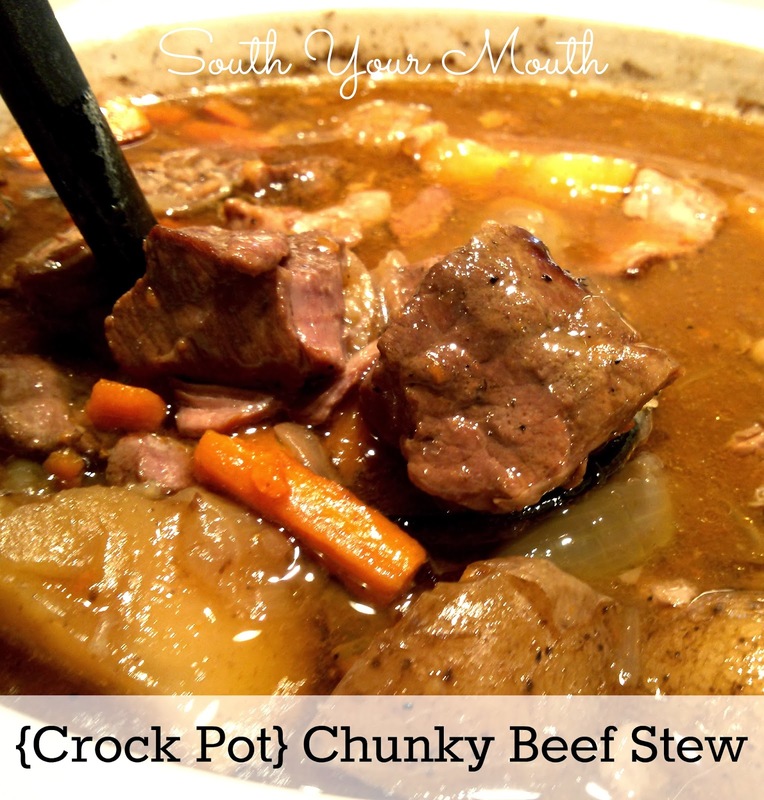 This is going to be my go to beef stew!! I prepared the beef, carrots and I used baby potatoes. I did it last night and refridgerated it overnite. I prepared the soup etc this morning. It is now at home cooking away and my husband text me to tell me his mouth is watering. He says it smells so good! I am anticipating an awesome recipe. I make lots of soups and stews and I like your method and ingredients. Thank you and I'll keep you posted. Wendy from Winnipeg, Canada.